Nigeria's most accomplished detective and a gallant police officer with numerous national and international accolades recently celebrated his birthday in a remarkable acquiescence and modest manner. In all his Career successes, his warm heartedness, good-naturedness, amiable and charitable nature has remained his forebearing testament. Exactly on the 17th of March, 1975, Heavens released unto us the supercop of our time, Deputy Commissioner Of Police, Abba Kyari in todays Yobe State. He joined The Nigeria Police in the year 2000 as a cadet Assistant Suprintendent of Police and the rest is a story of a myth that have defiled conquerors. His colleagues have wondered the altruism associated with his character. This is simply because he has fought against everything that will wear him a robe of narcissism, self-adulation, self-seeking, egostic attitude and self-important. it will not surprise his contemporaries if his next award will be as the best team player in The Nigeria Police. However, his professional exploits have insisted on speaking for him even though he believes that he is who is when no one is watching. Indeed, real heroes don't do it for the cheers of the crowd. Real heroes risk their lives everyday even for the dirtbags who disrespect them. As we celebrate this decorated crime burster on his birthday, we will higlight some of the National and International meriterous recorgnition and awards to his credit. We will chronicle some of the accolades that have distinguished him in his career. Presidential medal for courage from President Mohammadu Buhari on 1/4/2016. • Arrest of Twenty-two (22) Boko-Haram Terrorist gang members responsible for the kidnap of the Chibok School Girls in 2014 and also responsible for series of suicide bombings/several attacks and ambush against Security Agents in Borno, Yobe and Adamawa States. • Arrest of the Deadly Offa Bank robbers that invaded Offa Town, Kwara State and robbed five commercial Banks, the gang also murdered over Thirty-one (31) innocent Nigerians Making it the deadliest Bank Robbery in the History Of Nigeria. •Arrest Of a Notorious Criminal who threaten to Kill the Former Vice President of Nigeria Atiku Abubakar and his Family. • Arrest of the attackers of Nimbo Community in Enugu State and many more breakthroughs that are too numerous to mention. • He Fought Armed Robbery, Kidnapping and other Violent Crimes in Lagos State to Standstill during his five (5) years as OC SARS Lagos State from 2010-2015. Now he is recording tremendous successes across the Nation as the Deputy Commissioner of Police In-charge of IGP Intelligence Response Team (IRT). He is a caurageous officer who believes in T. Blauer's words "never let fear, pride or ego to dictate your next battle plan". In his many battles with the underworld, he looks at the tenacity, the will, and the indignation that propels his action against them. His hatred and onslaught against criminals and criminality is born out of his love for a peaceful world. 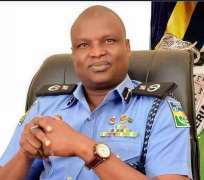 Like Lieutenant Colonel Arnaud Beltrame of France who exchanged himself for a hostage during a supermarket siege in southwest France and eventually paid the supreme prize, DCP Abba Kyari have severally laid his life on line that Nigeria will be safe. Congratulations on your birthday, our supercop.